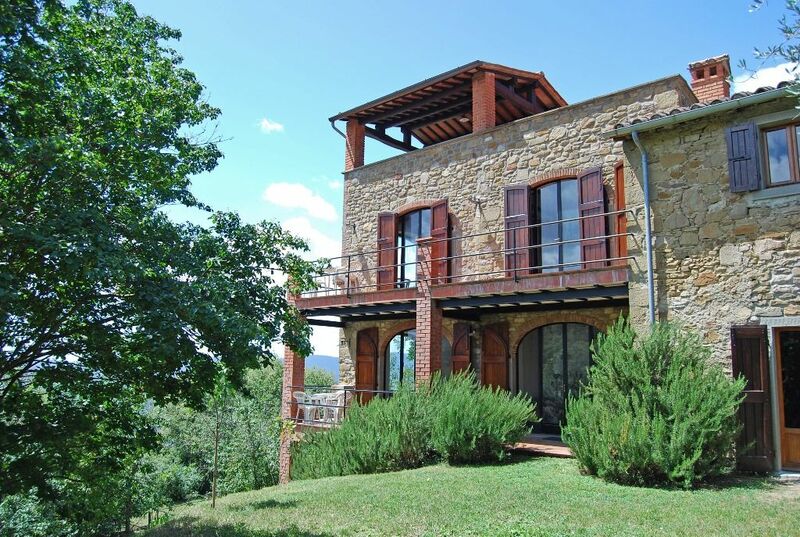 Our villa Torre Toscana is perched high on a hill in Tuscany, on the border with Umbria. It sleeps 11-15 people in spacious, comfortable rooms. From its many terraces and the gardens, you can see for miles around in all directions. There are 5 bedrooms and 3 bathrooms. 2 rooms have a double sofa bed each so the total number of guests can reach 15. The circular pool is for guests' exclusive use. The villa is located on 1 hectare (2.5 acres) of private property. Large groups can take advantage of the many shared common spaces together, while enjoying separate sleeping quarters in the evening. The location is absolutely quiet and you can spend a relaxing holiday immersed in the Tuscan landscape. Very panoramic position and great location for exploring Tuscany and also Umbria. There is a piano in the living room: only expert musicians can use it and it must be requested at the moment of the reservation. Otherwise it will be locked closed. Circular Pool (8 m diameter, 1,2 m depth) with lounge chairs, open May to Sept.
A wonderfully isolated villa with character, marvellous views, plenty of space and wildlife! We were a party of eight looking to relax and explore some of the parts of Tuscany and Umbria that we had not seen for a few years. The villa was an excellent base. We rarely drove for more than an hour and a half to any of the hill-top towns that we had on our list. On days when we didn't set off for a lunch in Pienza, Assisi, Cortona etc, we relaxed in and around the pool, barbecued in the grounds and went for walks along long-forgotten tracks through the surrounding woods. We only needed to use the formal bedrooms to sleep in leaving much room for quiet retreats in the remaining living rooms. It took a couple of days for each of us to work out the best combination of sleeping with shutters and windows open or closed - this was mid-July - but once cracked we all slept peacefully. The biggest thrill of the stay was the regular visits from a family of wild boar. Around ten of them would wander through the gardens chomping away at fallen plums and anything else they could find to eat. The challenge was finding a place to watch them from without frightening them away. Having four pianists in the group meant that the grand piano was quite a bonus (thankfully spared from the risks of less-accomplished hands, sticky fingers and other hazards and so in very good condition). Michelangelo and his local team were most helpful and responsive to any requests. Another challenge for us was deciding where to eat each day - with so many choices. The favourite for lunch was the tower on top floor with its panoramic views. This also tied for the best place for pre-prandials with sitting around the 150-200 year-old mulberry tree in the front garden. And for supper it was either the dining room with windows and shutters wide open or the near end of the long row of "beer keller" tables beside the barbecue. And on clear nights we finished things off by star gazing. There was so little light pollution that we could even make out Saturn's rings with a pair of binoculars. We would thoroughly recommend this villa as a way to get away from it all and explore the region. Thank you David, it was such a pleasure to have you here! The most amazing place to stay for our holiday! We were 5 couples with two small kids under a year staying in this beautiful house in Tuscany! We stayed for a week and loved it! We did not want to go home again. The pictures of the house from the website does not lie.. The most amazing views and surrounding areas. We would recommend this place to everybody going to Tuscany. The house was nicely cleaned when we arrived.. our only dislike was the distance going to a big supermarket (about 20-25 minutes by car) and the provided baby beds was no good unfortunately. But other than that everything was perfect about our stay at Torre Toscana. The owner also provided very good customer service to us! Thank you for your review! We're so glad you enjoyed your stay. We're very sorry about the baby beds, thank you for bringing the problem to our attention, we will make sure to provide suitable ones in the future! Nothing to criticise. Nice pool. A lot of space. Restorative calmness. Well-kept house. Stunning views. And a lot of boars in the garden. We all loved it,very good service and help from the family, the house was clean and it was a very beautiful nice vacation. Das Haus liegt einsam auf einem Olivenberg neigten von Bäumen. Drumherum eine wunderbare Aussicht in das Tal. Es sind genügend Gartenmöbel vorhanden, so dass man ohne großen Aufwand jede Mahlzeit / Kaffe an einem anderen Ort einnehmen kann. Das sehr große Haus war bei Uebergabe sehr sauber, die Zimmer sind sehr groß, die Einrichtung, insbesondere die Bäder haben alte Möbel - allerdings völlig intakt. Die Kueche ist sehr groß und gut ausgestattet. Die Außenanlagen ist sehr schön, wir waren mit Hund da. der Pool liegt im Schatten von Bäumen und hätte etwas Größer ausfallen können. Es kommt jeden Tag ein Poolboy der den Pool reinigt. Liegen am Pool sind vorhanden. Es gibt einen gemauerten Grill den wir benutzt haben, ebenfalls sehr sauber bei Ankunft. Die Zufahrt zum Haus ist ok, die letzten 300 m sind auf unbefestigter Straße was allerdings kein Problem ist, der nächste Supermarkt ist in Umbertide, dort kann man sich mit allem versorgen was man braucht, die kleineren Supermärkte in der Umgebung haben wir nicht angefahren. Insgesamt sehr empfehlenswertes Haus zum Abschalten, einige sehr schöne Sehenswuerdigkeiten (Assisi, Perugia, Trasimenosee..) in der Nähe. Outside, the garden surrounds the house and offers a vast choice of places to relax and dine al-fresco, either nestled in the woods or overlooking the hills. There is a large barbecue and wood-burning oven for cooking outside. The pool is circular, with a diameter of 8 meters. Inside, large living and dining rooms comfortably accommodate a full house. Extras to be paid on spot: Final cleaning (€ 200) A refundable safety deposit of € 500,00 is due upon arrival. At the end of your stay, your deposit will be returned to you, barring any property damage.